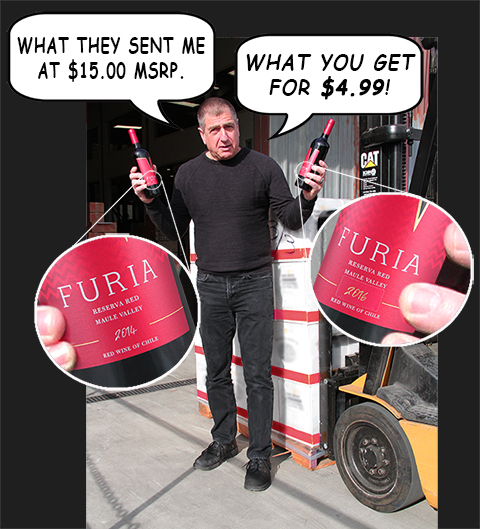 I ordered this gorgeous 2016 Furia Merlot/Malbec from Chile for the Club... and it arrived mis-labelled as 2014. The Feds would never allow me to sell a 2016 vintage wine with a 2014 label. I told the winery I was sending it back, they countered with an incredibly low price and a roll of stickers… I would never send a wine with a sticker as a Club selection...but for $4.99, I would do it all day long! Deep rich berry nose, oak aged, long complex finish… We have authority to move it out at $4.99!!! I would not be disappointed if I walked into a wine shop and paid $19 and took it home. Take a look at the label...you can hardly tell the difference!!! THE PRICE DIFFERENCE IS HUGE! This happens once in a while...miscommunication, bad execution, who knows? I'm passing the savings on to you! PS: The wine is indeed 2016 vintage, and the bottle will arrive stickered as 2016.